Inferior ST elevation is found in leads II, III and aVF. This ECG is from a man in his 70s who presented hypotensive and febrile with suspected intra-abdominal sepsis. 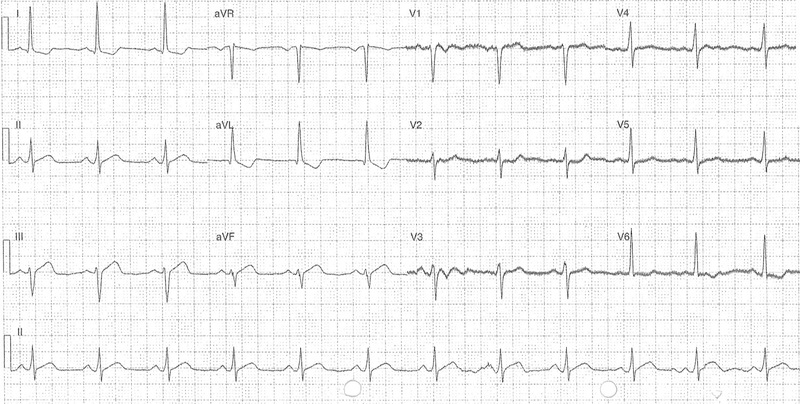 This ECG shows ST elevation in II, III, V4-6 with unusual morphology of unclear origin. This ECG is from a man in his 70s who presented with chest pain. He had a history of COPD. This ECG shows massive inferior ST elevation with widespread ST depression. The most likely cause was an acute inferior infarct. This ECG is from a middle aged man who presented with 1 hour of chest pain. This was a right sided ECG where V1-6 are really V1R to V6R. This ECG shows ST elevation in inferior and right sided leads, caused by a proximal RCA occlusion. This ECG is from a middle aged woman who presented with chest pain and dyspnoea that improved after nitrogylcerin. This ECG shows subtle ST elevation in inferior leads with reciprocal changes in aVL. Troponins were positive. The computer misinterpreted the ECG as normal.